With *mumble, mumble* days left until December 16th, I decided it was time to make a list of things to do to get this build done. Let’s just say I didn’t feel better after making the list. The past week I’ve been working on odds and ends to fill up the book trunks. 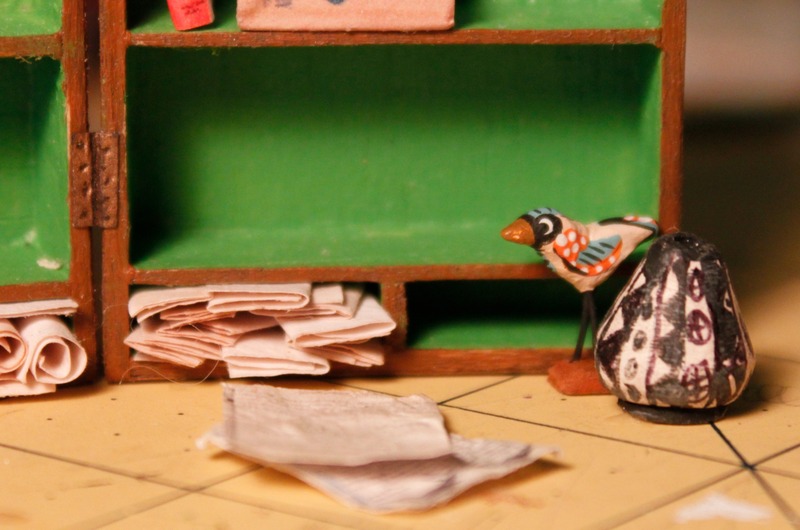 I’ve been trying to make books, artifacts, papers, and collected goodies to fill the shelves. I’m happy to say the 2 bigger shelves are almost done. The little lion statue is made from a little plastic toy that I glued to a piece of wood. It needs to be touched up. I made the mistake of trying to touch it up with a sharpie and now it taunts me. The little guy wearing the beads and shells was based on a little East African statue I found on line. The tiki is a bead. All the dollhouses I have made have a little tiki in them. It’s an easter egg that represents where my husband and I were married. The little bowls on the bottom shelf are the tops of acorns. 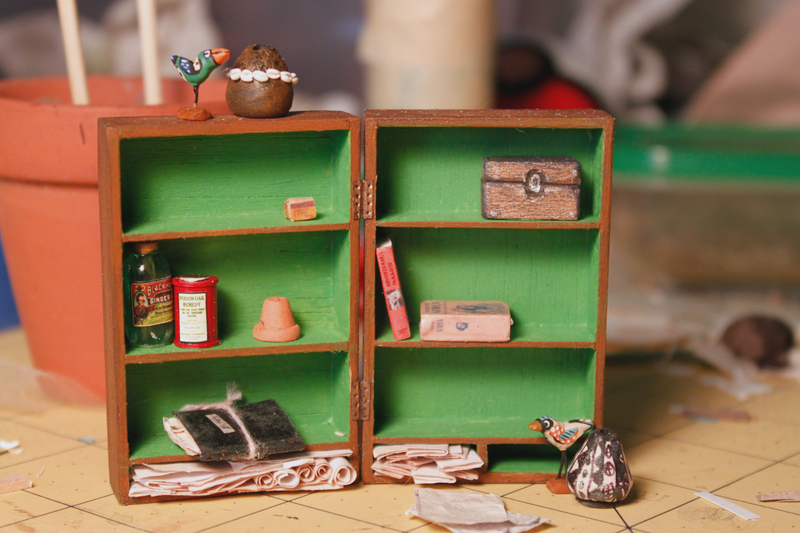 The wooden box on the bottom shelf is just a little block of wood that has been detailed to look like it can open. There needs to be something else on the shelf that has the folded fabrics, I’m just not sure what (maybe a gourd or wooden mask). That spot will be low priority though. If I think of something great, if not no big deal. These shelves are mostly done. I finished up the ammunition storage box and the little strong box today. There are a few more details I’ll be adding, mostly papers and maybe one more artifact. I’m loving the little bird. It just needs a little something by it. I have a few things I can try. Again, not a huge priority. I was hoping to achieve the messy genius look without it being so messy that it detracts from the details. The research table will probably be a bit more messy. Open journals, charts, jars of butterflies, papers and so on and so on. These shelves are giving me a problem. First, I think I’m going to repaint the green. I like the idea of green, this one is just too lime green. Second, I didn’t factor in the size of these shelves when I made them. 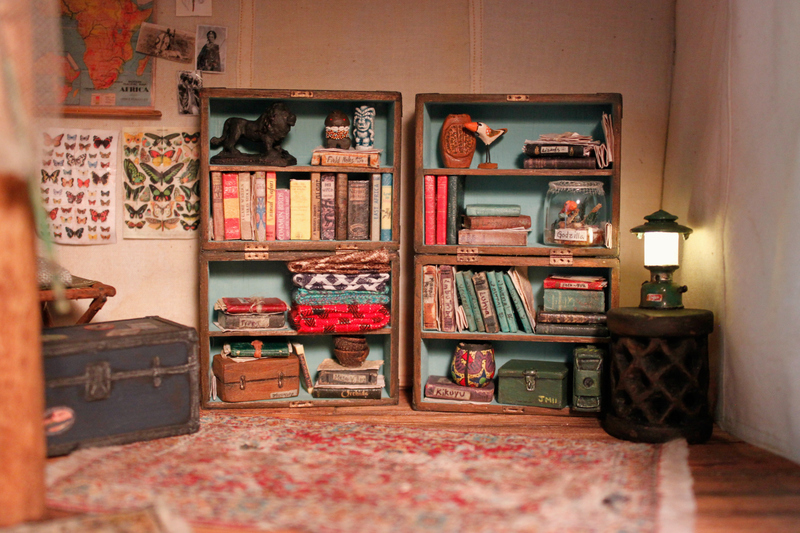 I based them on an antique campaign book trunk. It’s smaller and thinner than the blue shelves. Books don’t fit well. Papers don’t fit well. I tried making a box of Kodak film, my adventurer likes taking pictures. A shelf of camera gear and film sounds doable. I’m not sure it looks like a box of film, so maybe camera equipment minus boxes of film. I’m also thinking about bottles of chemicals used in collecting samples, cleaning equipment, and studying things under the microscope and s me boxes of slides. 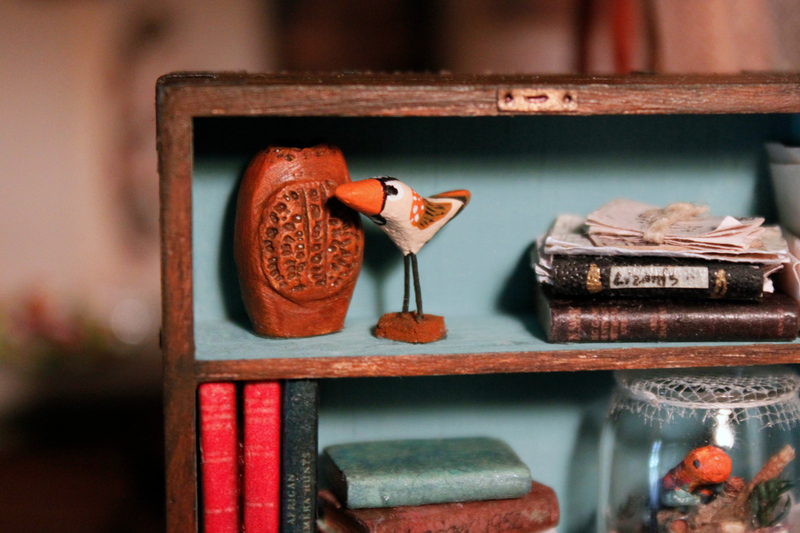 I’m working on a little clock and have a few pieces of pottery and birds to add. Can you tell I like the birds? I’m sure it will all fall into place. I might just have to paint the inside and put it aside for a few days. Sometimes I’ll get “ahha” moments at 3pm on some random Tuesday. As for the rest of the list, I think what I’m going to try and do is break the list down into groups of easy, time consuming, and “I’m avoiding it because it is intimidating me or I’m scare of messing it up”. Then I’ll try to knock a few off each week. Fingers crossed it will be done in time…less than 2 months. Oh and the one thing I swore I would do different in this build from my last one- not saving lighting until last. What have I done with the lighting…saved it for last. Yay for learning lessons! I think that you have filled the shelves inside your trunk really well and I especially like the collection of old books which include a series of personal journals – a well considered inclusion, I might say! Ooh, I like that. I’ll have to look into finding a pith helmet or making one. Hmmm. Now my wheels are turning. Elizabeth is right, if you can make a pith helmet it’d be perfect! i like how the trucks are shaping up. 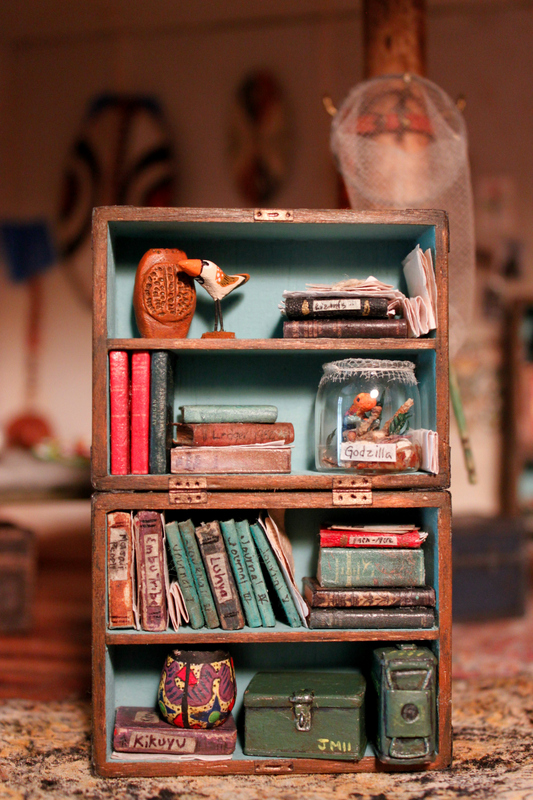 They don’t have to be perfect, books crammed in any which way is fairly realistic I think. Thanks! I’ll have to look into how to make a pith helmet. It would be a great detail.